Catherine from The Blissful Mind is by far one of my favorite bloggers. I may or may not stalk her blog and social media daily. She has written for us before about how to deal when you’re feeling overwhelmed and she is the go-to girl for living a simple life that you love. I was lucky enough to get the chance to interview her and learn more about why she started blogging, her productivity habits, and what her plans are for the new year. She is such an inspiration and I think you will all enjoy this interview! For those who aren’t yet familiar with The Blissful Mind, share a little about who you are and what you blog about. My name is Catherine, and I started The Blissful Mind about a year ago as a way to share my ideas with the rest of the world. It started out as a random mix of interior design, travel journals, and recipes, but over the past year I’ve been able to get clearer on my vision and I’ve started sharing tips on how to simplify your life and be more mindful in your everyday. I focus a lot on improving your mindset and wellbeing through actionable advice and I try to do it in a practical and relatable way. How did you get started with The Blissful Mind? What inspired you? I’ve wanted to start a blog for years, and I’ve created lots in the past but never stuck to them because I had no idea what I was doing. 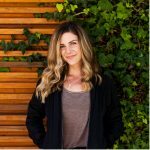 I think what truly inspired me to just put myself out there and keep going was seeing Jordan Younger of The Balanced Blonde find great success through her blog. I went to college with Jordan and had a few classes with her, and it just made me think, ‘Hey, she’s doing this. So can I!’ So thank you to Jordan for that! What do you wish you knew before starting your blog? I wish I would have just started a long time ago! I wish I would have known that I had no need to be embarrassed that my friends and family would find my blog and that there’s whole world out there full of people who think just like you. I’ve learned so much about myself and what my true passions are through my blog, and I wish it hadn’t taken me this long to just give it a go! You talk a lot on your blog about staying productive, what tools do you use to keep yourself productive? And what do you do to avoid distractions? My absolute favorite productivity app is Todoist. It’s the simplest, easiest way to keep track of your to-do list and I find it really useful for recurring reminders that I might forget otherwise. I’m also a big fan of Zenpen.io which is a minimal writing tool you can use so that you don’t get distracted. I can’t say that I’m very good at avoiding distractions in general, but if I really need to get something done, I put on some music and just power through until I’m done. I definitely work best under pressure! I’m always curious about people’s routines and daily habits. What does your average work day look like? I work 9-5 as the Operations Manager for a non-profit, so I’m basically in charge of keeping the office running smoothly and helping with whatever event is going on at the time. I can’t say that my work is very exciting during the day as I’m often just answering emails, processing donations, and helping with miscellaneous projects. I do try to always keep tea and an essential oil diffuser at my desk to help with any stressful moments, and I’m a big fan of going for a work after my lunch break. You also talk about minimalism on The Blissful Mind. Tell us a little about how you’ve adopted minimalism into your life. I came across the minimalist lifestyle because I read Bea Johnson’s Zero Waste home, and it just sparked an interest within me, so I sought out other resources that focused on downsizing and simplifying. As I came across more blogs and YouTube channels, I realized there was this whole minimalist movement that I hadn’t heard about before. I started the usual way people do by getting rid of things that I didn’t need, and I embraced a capsule wardrobe because I was inspired by into-mind.com. I’ve definitely been able to change my spending habits because of this lifestyle, and it just makes me appreciate what I have more. We’re called Life Goals Mag, so of course I have to ask, what are three big life goals of yours? My number one goal is always to travel. I used to travel a lot as a kid, and it’s something I wish I could incorporate into my life more these days (being a working adult makes it tougher!). Right now, Berlin, Vienna, and Prague are at the top of my list! But I also just started grad school to get my Master’s degree in Health & Wellness Coaching, so one of my top priorities is to get that done and become a health coach. As for a third goal, I would love to be able to make an income through writing – whether from my blog or other publications. I have so many different ones from all different niches! For blogging tips – byregina.com. For style & minimalism – into-mind.com. And a new recent favorite has to be purewow.com for basically everything! What can we expect to see more of on The Blissful Mind in 2016? I’m planning to incorporate more content around mindfulness and well-being throughout 2016, while still keeping the focus on making life simpler. I’d also love to start a YouTube channel this year to share my ideas in a more personal way where people can get to see my personality more! If someone is just discovering you for the first time, what posts should they start with? Is Minimalism Just Another Trend? Thank you, again, Catherine for the opportunity to interview you! You all can check out Catherine on The Blissful Mind blog, Twitter, Instagram, and Pinterest. Photos above are from Catherine’s Instagram feed. What Does a Day in the Life of a Doula Look Like?